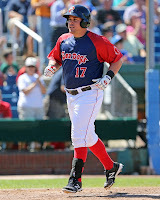 In the final week of the regular season, Portland outfielder J.C. Linares bashed his way to the SoxProspects.com Player of the Week, while a pair of outstanding performances propelled Sergio Gomez to SoxProspects.com Pitcher of the Week. It is the second player of the week award for Gomez, who won in August 2012. Surprisingly, Linares is a first-time winner. Linares had a largely disappointing season between Portland and Pawtucket, but the outfielder had an August revival which he capped with an outstanding final week. In eight games, Linares had a monster .486/.500/1.000 line, going 17 for 35 with four home runs and four doubles. As Portland made a long-shot run at the Eastern League wild card spot, Linares went 11 for 19 with three homers and 10 RBI in a four game set against New Hampshire. As Greenville sputtered through the end of a difficult August, Gomez was on of the lone bright spots for the Drive. The 6-foot-3 Colombian right-hander was promoted from Lowell in the middle of the month after an outstanding season with the Spinners, and continued his excellent work when he moved south. Gomez tossed six shutout innings in both of his starts on the week. In his 12 innings, he allowed only five hits, striking out nine and walking only four. In 15 appearances across two levels, Gomez finishes the 2013 campaign with a 2.08 ERA and 1.090 WHIP.